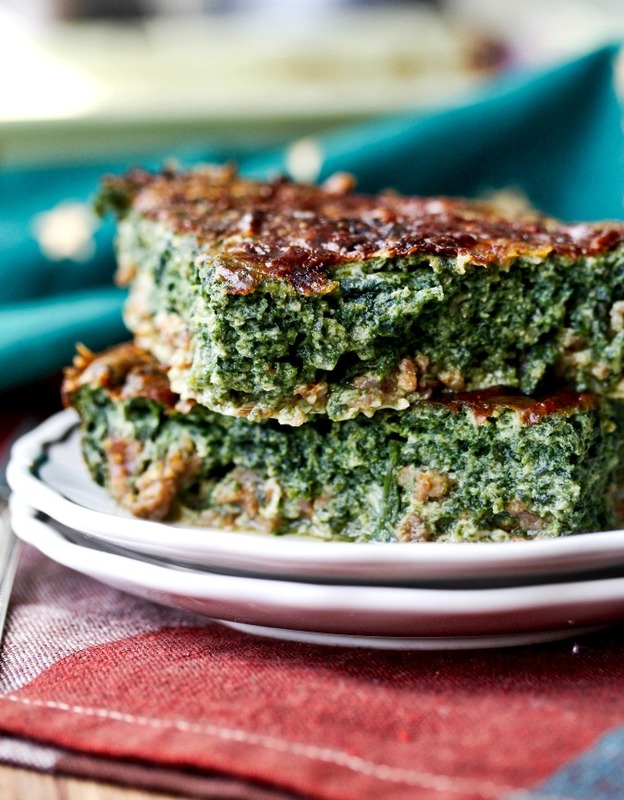 This Sausage and Spinach Pie is packed with the goodness of spinach. A lot of spinach. There are two pounds of fresh spinach in this spinach and sausage pie. That's a quarter pound per serving. There are also leeks, eggs, and milk. This is a simple crustless pie that can be served for breakfast or brunch. If you omit the sausage, it would make an excellent side dish for dinner. 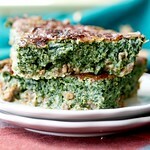 I used Italian sausage in this spinach pie, but you could use breakfast sausage, or even ground beef. You could also omit the meat altogether to make it vegetarian. This is a really easy dish to make, and would be delicious for Easter Brunch. 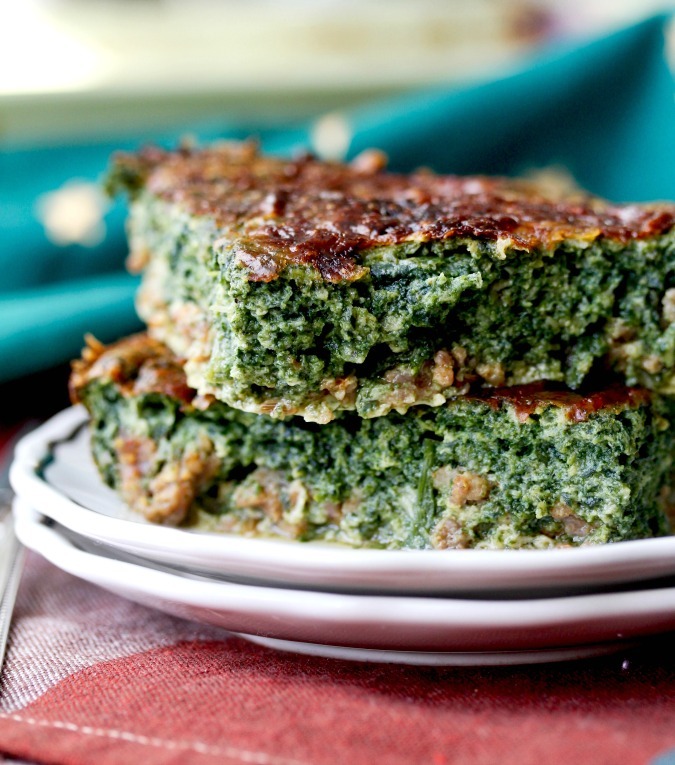 You can bake this spinach pie in a round or rectangular two-quart dish. You could also make it in advance and bake it the next day, which makes it great for brunch for a crowd. P.S. It's low carb, nutritious, and delicious. To make this dish, you sauté the leeks, and then add the spinach and then wilt the spinach in the same skillet. Once you've combined the vegetables with the eggs and the milk, you puree the mixture either in a blender or with an immersion blender. If you like spinach, you should try this Spinach and Olive Focaccia, these Pepperoni Pizza Spinach Squares, and this Bacon and Sheet Pan Quiche. For my favorite breakfast dish ever, try this Mexican Breakfast Casserole. 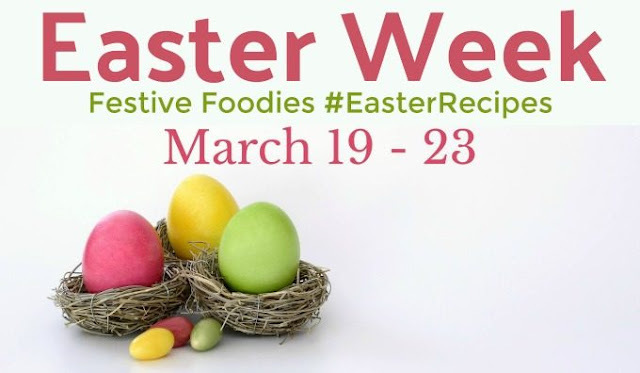 I am participating in Easter Week, hosted by Christie of A Kitchen Hoor's Adventure. According to Christie, a kitchen hoor is someone who'd rather collect kitchen gadgets over shoes. Yep, that would be me too. After the recipe, there are over 15 links to more recipes for Easter! Preheat the oven to 400 degrees F and spray a two quart casserole with spray oil. In a large skillet, sauté the sausage until fully cooked. Drain, and set aside. Wipe out the skillet. Cut off the green parts of the leeks, and cut the white parts lengthwise into quarters. Swirl the leeks in a large bowl of water until they are cleaned. Drain on paper towels and then chop into small pieces. Melt the butter in the skillet. Sauté the leeks with some salt and pepper, stirring occasionally, until soft and translucent. Chop the spinach into smaller pieces. Once the leeks are ready, add the spinach in batches while covering with the pan lid until each batch wilts. Add more spinach, sprinkling with salt and pepper as you go. Add the crushed red pepper and nutmeg to the final batch. Once all of the spinach is wilted and most of the liquid has evaporated, transfer the spinach and leeks to a bowl to let cool. Whisk in the milk and the eggs. Using a blender or immersion blender, puree the mixture. Season with salt and pepper to taste. Spread the sausage over the bottom of the baking dish. Pour the spinach and egg puree over the sausage. Sprinkle the top evenly with the Parmesan cheese. Bake for 45 minutes, until a knife inserted in the center comes out clean. Serve warm or at room temperature. This recipe was adapted from David Lebovitz, who adapted it from A Platter of Figs by David Tanis and Alice Waters. Karen's Kitchen Stories is a participant in the Amazon Services LLC Associates Program. If you purchase something from Amazon via a link on this site, I may receive a very small commission in Amazon store credit at no extra charge to you. Karen! Wow...this is Springy, beautiful, and nutritious. I can't wait to try this. Thanks Camilla! It's really good. I love spinach pie. I have never tried putting meat in it. Can't wait to try it. It adds a nice richness. Thanks Wendy! I love spinach pie! It's so good. I love that you added sausage with it. 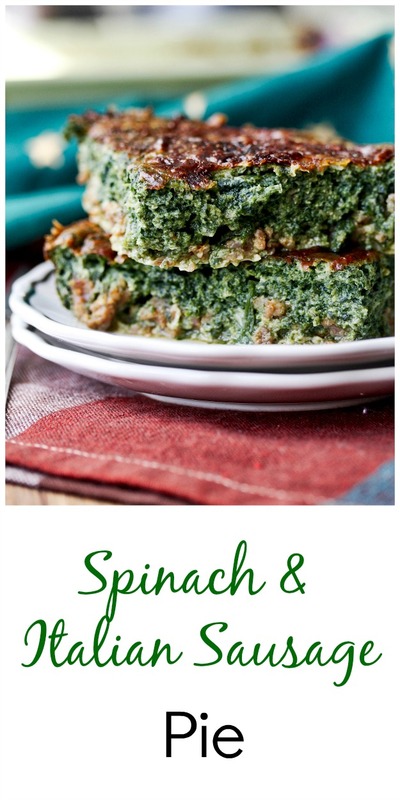 I think spinach and sausage are a perfect pair. Oooh. This would be awesome in nazook! I love how much spinach you end up getting in a serving when it's in pies like this. It sounds delicious! Thanks Colleen! It makes it so much easier. Yum! I love how hearty this sounds!